Call it a miracle! Call it an act of God! Inspirational! Phenomenal! A dream come true! 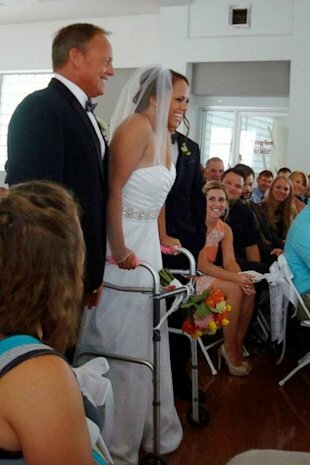 But one bride, Stevie Beale, 24, of Toledo, Ohio, who lost feelings in both legs following a car accident in 2006, defied the odds and walked down the aisle to her groom, Jared VanAusdale, 34, with the aid of a walker and escorted by her father Al, and her physical therapy trainer. It is stories like these we love that brings us hope and increases our faith and trust in God that with Him all things are possible, when we believe! 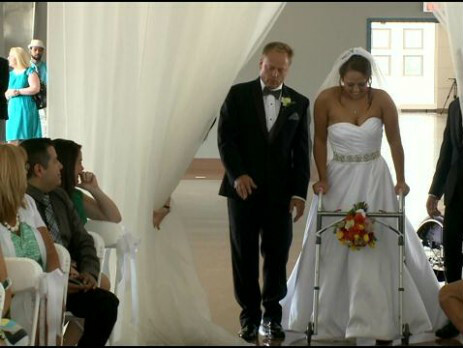 Stevie Beale's wedding last Saturday came seven years after she was paralyzed from the waist down in a car crash, making her walk down the aisle that much sweeter. Beale, 24, of Toledo, Ohio, walked down the aisle to her groom, Jared VanAusdale, 34, with the aid of a walker and escorted by her father, Al, and her physical therapy trainer. It was a moment Beale says she has visualized ever since June 15, 2006, the day of the crash. "At that point I didn't know what that meant," Beale, speaking to ABCNews.com by phone from the couple's honeymoon in Hawaii, said of her dream to walk down the aisle. "As I progressed in my recovery and came to terms with my injury I realized whether it was me taking steps with the braces or without the braces it didn't matter, it was just me taking steps on my own," she said. Beale did walk down the aisle with braces, something she said she will have to do for the rest of her life, "unless there's a major medical breakthrough." She was paralyzed at age 17 in a crash that killed one of her friends, a passenger in the same car. Beale, who will begin graduate school in the fall to pursue a degree in counseling, set her goal to walk down the aisle of her own wedding even before she met her groom. The newly-minted VanAusdales met three years ago, well after Beale's accident, when Beale reached out to another woman who had been injured in a car accident. That woman, it turned out, was a friend of James. "He was just always at the hospital, cracking jokes and trying to make everyone feel better," she said. Beale says she zeroed in on her goal of walking down the aisle last October after the couple became engaged. Her training included walking between 200 and 300 feet at a time three times per week in physical therapy, with VanAusdale always cheering her on. "He had been encouraging me through the whole process when things were getting hard and I wasn't progressing as I wanted to," she said. "It was him who encouraged me on and made sure I reached my goal." Beale says she remembered she had to try to block out her emotions during her walk down the aisle to avoid being overcome by it all. "I would have stopped halfway and said, 'Somebody carry me,'" she said. "Looking back at videos now I can tell I was beaming and the happiest I've ever been." After the ceremony, VanAusdale carried his bride back down the aisle. The couple later danced their first dance together, with Beale standing out of her wheelchair, at their wedding reception. "It was pretty overwhelming," Beale said after her wedding day. EMB take this opportunity to congratulate the VanAusdales and to wish them all of God's richest blessings, long life and success! Awww, this is so sweet. Congratulations to the both of them! Hi Janelle, appreciate your continued support. God bless you! This is quite romantic and of course emotional. A message to everyone out there. We can realize our dreams notwithstanding our physical incapabilities. Congratulations to Beale and Jared. #HML. Hi Phillips, I absolutely agree with you. Beautiful love story in every sense of the word. Surely we can all realize our dreams!! Have a great day and I appreciate you stopping by and leaving a comment. Blessings and have great day. Aww.... this brought tears to my eyes, what a motivational story. Wishing the couple all the best! Very motivational indeed Myne. For me it's among my top motivational stories of 2013 thus far!